He was a skilled painter. Highly sensitive, Gajanan Haldankar was a curious mixture of bohemian full of energy and an ascetic. He read and was touched by lives of Swami Vivekananda, Jesus Christ and others. As an experimenter, a searcher, one could almost sense his mind change half way through a painting. At times, it lay unfinished, unsigned. Like S.L. Haldankar, Gajanan Haldankar too loved music and chess. Executed commissioned portraits of some eminent personalities, including Mahatma Gandhi, Field Marshal General Manekshaw, Attorney General Shri Gupte. He was nominated as member of the Judging Committees for various exhb. Examiner, Govt. Diploma Art Exams. Associated with Art Society of India as Secretary and Chairman. 1981 He unfortunately died in an accident. G.S. Haldankar did not take any formal training from any specific schools. S.L. Haldankar was his tutor and mentor. 1929 Annual exhb., Bombay Art Society, Bombay. Group exhb., Academy of Fine Arts, Calcutta. 1931 Mysore Dassara Exhb., Mysore. 1933 Annual exhb., Bombay Art Society`s Exhb., Poona. 1938, 39-40 Group exhb., Academy of Fine Arts, Calcutta. 1989 AIFACS Exhb., New Delhi. 1998-99 The Great Indian Master Painters, joint retrospective exhb. of S.L. Haldankar and G.S. Haldankar, Nehru Centre, Mumbai. Delhi Art Gallery Pvt. 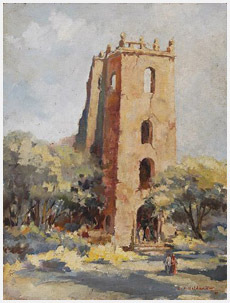 Ltd.
1929 Won the President`s Prize, Bombay Art Society, Bombay. President`s Gold Medal, Academy of Fine Arts, Calcutta. 1931 Silver medal, Mysore Dassara Exhb., Mysore. 1933 Best Portrait Prize, Bombay Art Society`s Exhb., Poona. 1936-37 Silver Medal, Indian Industries, Bombay. 1938 Academy`s Gold Medal for the best exhibit, Academy of Fine Arts, Calcutta. 1939-40 President`s Gold Medal, Academy of Fine Arts, Calcutta. 1989 Gold and Silver Medals, AIFACS Exhb., New Delhi. Nominated as the panel of judging committees of various exhb. 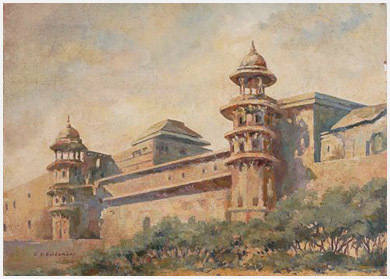 Taught drawing and painting at the Haldankar`s Fine Art Institute for over sixty years. He was a Visiting Lecturer at Govt. College of Art and craft and various other Art Institutions and Art Societies.